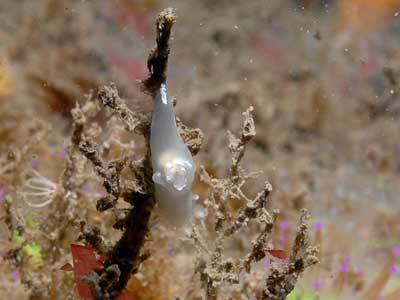 MOLLUSCA : NUDIBRANCHIA : Okeniidae SNAILS, SLUGS, ETC. 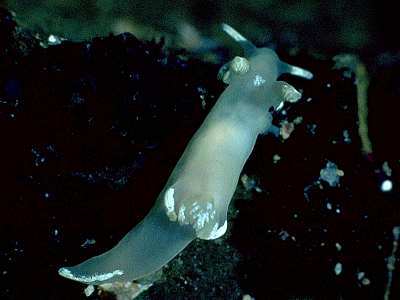 Description: Trapania pallida is translucent white in colour with white patches on the rhinophores, processes, gills and tail. There are lateral processes directed posteriorly from the bases of the rhinophores and another pair alongside the gills, similar to Trapania maculata, however in T. pallida they are shorter. The maximum recorded length for this species is 15mm. Habitat: The prey species of T. pallida appears to be a kamptozoan, possibly a species of Loxocalyx. It is usually found amongst bryozoans, hydroids and sponges on rocky sublittoral cliffs and outcrops, in depths of 10-20 metres. Distribution: Records of this scarce species are from the west coast of Ireland, Loch Sunart in western Scotland, the Isle of Man, south west England, and from the Atlantic coasts of France and Spain. The pattern of the white pigment on the body. Recurved processes at the base of the rhinophores and alongside the gills. Picton, B.E. & Morrow, C.C. (2016). Trapania pallida Kress, 1968. [In] Encyclopedia of Marine Life of Britain and Ireland.